The Owner's Manual does not cover everything so will try to list some of the "un-covered" items you want to know how to use or change. These are areas of concern that have been noted on the ThunderbirdForum.com and the ThunderbirdNest.com sites over the past years. Sirius satellite code for subscribing to service ~ ? 1 Interior Lights / Dimmer Switch operation: PLEASE READ THIS. When dimmer switch (on your dash) is in it's upmost position, ie, high intensity, the automatic timer that shuts off the lights will not go out until the automatic timer for battery conservation kicks in ~ anywhere from 20 to 45 minutes ~ takes the longer time if the rear view mirror lights are in the "on" position. To eliminate this "problem?" when you want the high intensity light on, just back off the dial a degree. The high point is there when you want the lights to stay on for a length of time. If your interior light is still on after an hour and you have the key off, see your dealer as there may be a problem with the "battery conservation" minder. Is yours lifting at high speed? 1. The cover needs to be tucked in under the body metal at sides and back. Are gaps appearing when you try to put the cover on and you can not get it tucked under? 1. Try cycling the soft top a few times to "loosen" up the joints & lower the top further into the bootwell. If that doesn't work, see your dealer. For more tips on installing your 2002 or 2003, 2004, 2005 boot cover...with pictures: check out this page. 3 Owners Manual: If your manual is lost, your Ford parts department is able to order a new one for you. You may also use Ford's Owners website for downloading a copy. OR Motorcraft link for free download >owners guides (left hand column) > select year and model > select owner's manual. These manuals are in pdf format so you will need a pdf reader installed on your computer. Adobe.com offers a free download of their pdf reader. Parts #s for the manuals are on the Ford Accessory page near the bottom if you want to order from your Ford dealer's parts department. 4 Hardtop Installation: Directions are in the Hardtop booklet. Check your owner's manual carrying case and see if it's in there. If you do not have one, you may again order this thru Ford. It may also be found as a pdf file on the above Motorcraft website. You will also need the hardtop tool. a #T40 Torx driver from your local hardware store or part # 4W6Z-76502F08 from your Ford dealer parts department. To remove the old tape, simply pull it off. If you notice adhesive residue on your vehicle, clean the surface with isopropyl alcohol or a very light non-abrasive soap. Don’t worry about positioning the tape perfectly on your first attempt; the tape won’t bond completely until it has been in place for more than 24 hours. Only use the tape that has been approved by Ford for use on painted surfaces. Before applying new tape, make sure the surface of your vehicle is clean and dry. The temperature of the body surface should not be lower than 65 degrees or higher than 90 degrees. Retract the convertible top to the open position. Wipe the surface with alcohol, using the lint-free cloth that came with your vehicle. Select the piece that was cut for the driver-side front (DSF) area of your vehicle and remove the backing paper. 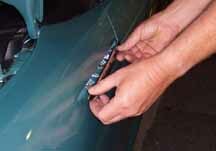 Starting at the rear of the door opening, apply the tape to the quarter panel. At the rear corner curve, fold the flap downward so it wraps around the edge of the sheet metal. Slowly use pressure while applying the tape, pressing to smooth out wrinkles and air bubbles. Repeat the above steps for the passenger front trim piece, the driver-side rear (DSR) and passenger-side rear (PSR) pieces. You'll need the right and the left hand sides; they are different. To Remove: There are 3 tabs on the "ornament." Those tabs will need to be pushed back thru the holes in the fender to release the ornament from the fender. You will need to register view. Registration is free. switch down for 2 seconds. 1. Make sure window drop feature is working. installing the hard top, don't forget you can pull the plastic piece off the front of the hardtop to adjust the pins. Pull the plastic piece straight out from both sides, don't hesitate it is not going to break. After removing the plastic piece, use your hard top tool to loosen the 3 screws just enough to allow the front pins to slide freely. Lift the hardtop onto the car letting the back pins drop in freely, then guide the front pins into the holes on the front windshield. The pins will still be loose, so the top front pins should slide in easily. After your top is secure, retighten the 3 screws on each side and push the long plastic piece back into it's slots. Then follow the instructions for hardtop installation now that you have the top sitting securely on the car. If you are having trouble getting the screws at the front of the top to start then you might need to make an adjustment. Remove the plastic header piece from the front of the hardtop, it just pops off. 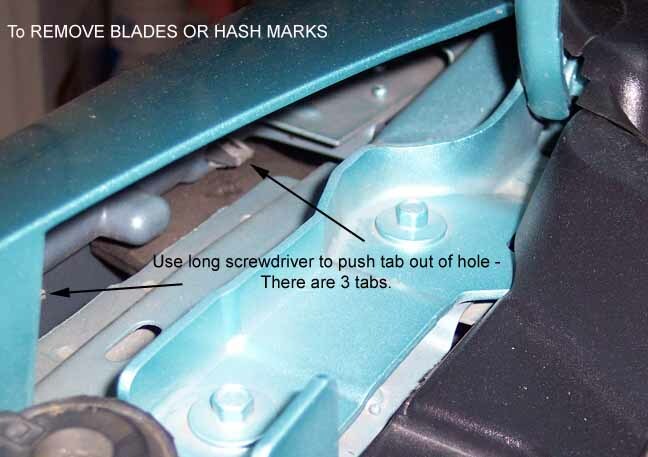 Around the screws is a plate with 3 screws that can be loosen with the hard top wrench. Slightly loosen the 3 screw on each side. Place the top on the car and put the rear levels in the middle position. Start the screws on both sides in the front. Once the front is tight move the rear levels to the locked position. Tighten the front screws one more time. Then tighten the 3 screw holding the “screw bracket” to the top on each side. Pop the header panel back on. Give this a try. It might be the ticket. With the top on the car, rear levers in lock position and front screws tight, back off the screws that go into to the top a few turns, maybe 3 or 4. Loosen the 3 adjuster screws on each side. If there is any bind the plates will move slightly even if it is a tiny fraction. Now snug, not tight, up the screws that hold the top to the windshield frame. Tighten the adjusting screws and then tighten the top screws. If the female receiving plate is aligned to your specific car, the male screws should, and I repeat should, go right up into the receptacle without doing anything other than to start turning the screws. Other tools may be found that will work. #14 Homelink installation for 02s and 03s. #15 Speaker Upgrades: see TBN You'll need to join if you have't already. It's free to join. #18 Sirius Satellite code: If you need to subscribe to Sirius to activate your Satellite connection on the 04 and 05 Thunderbirds, you will need the 12 digit account ID number. If you do not know the code, it is programmed into your stock 04-05 radio unit: You press the "Sat" button and the "1" button at the same time and Voila ... There Is Your Sirius Account ID Number. If that doesn't work, it should be located on the actual unit but that may require removal to find. #19 Hood Alignment: Is one side of hood sitting low? Open Hood: there are hood height adjustment bolts. On each side of the front cowl, just behind the headlight housing, you will find adjustable bolts with a rubber head cap over them that is adjustable. Turn in or out. As a matter of fact, they are loose and turn so easily that when cleaning in that area, they will / can move and change your hood alignment. First you have two ends to the visor 1) the ouside ends is were the rod attaches and makes a bend or small U shape and 2)the other side is straight and fits into a round holder. Now the problem is that the staight side that fits into the holder or ( middle of car) is friction fit into that round holder and what keeps it tight in the holder is just a wrap of felt around the rod. What you want to do is wrap electrical tape around that felt piece to make it thicker and it will fit tighter in that holder. The felt just wears out. That is it. Now there are two ways to get to that end piece. 1- If you pull back on the visors towards the window side and push hard, there should be enough play for the rod to come out of the plastic holder in the mildde of car. Then it is easy to just wrap the end with tape or material or rubber bands. Then push it back into the rounded holder. Now if you cannot get the rod out of that holder then the second way is a bit more complicated. 2- If you look closely at your plastic frame just above the window, it just snaps out if you pull down on it. visors comes off, then you can wrap the end nearest the center of the car like I said above, put the straight end back in the holder and then mount the ushape end back in place and then snap the molding piece back in place. I am sorry I do not have any pics. Most of the trim all on the inside of the car are attached by snap in so do not be afraid to pull down on the molding it will snap back up in place. This is actually the same procedure for realigning your hardtop if you cannot get the screws to go into the holder and screw down the top, but you are unsnaping the molding on the hardtop edge to align those locks while the molding I am talking about, is the one that the mirror is attached in for the visor problem. But both moldings just unsnap when you pull down on them and then just push then back into place and hit it with your hand to snap back. It is simple, if Bunny Lou can do it anyone can. 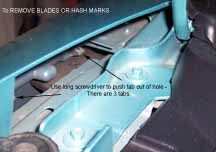 #21 Headlight Adjustment: Need to adjust your headlight and can't find the headlight adjustment screw? It is staring you in the face if you have the hood up and looking around the backside of the headlight. (sorry, just had to say that). Here's a photo of where it is located on the driver's side headlamp. It takes a 6mm Allen wrench to adjust it. Once you've found the screw, follow directions in manual on adjusting headlights, which you will find in the "Lights" section near the front of your manual. 22. Cracks occuring in your leather? They can be repaired but it does require some loving labor on your part. Read Color Plus's leather care booklet on how to restore.